Increases in data and computational power mean Artificial Intelligence (AI) has considerable societal impact. Although impactful, the AI theory is extremely far from creating true intelligence. Thus, the question is not what AI will do to humans, but how humans will improve AI and what they will do with it? 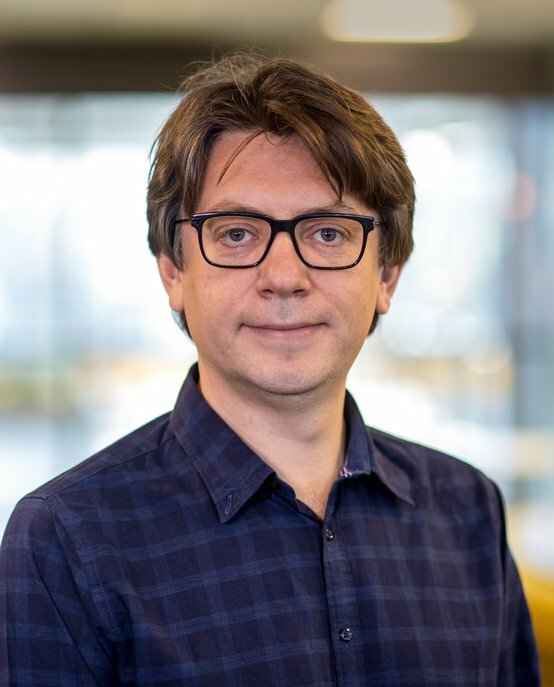 Decebal Mocanu is an Assistant Professor in Artificial Intelligence and Machine Learning within the Data Mining group, Department of Mathematics and Computer Science, Eindhoven University of Technology (TU/e) since September 2017, and a member of TU/e Young Academy of Engineering. His short-term research interest is to conceive scalable deep artificial neural network models and their corresponding learning algorithms using principles from network science, evolutionary computing, optimization and neuroscience. Such models shall have sparse and evolutionary connectivity, make use of previous knowledge, and have strong generalization capabilities to be able to learn, and to reason, using few examples in a continuous and adaptive manner. Most science carried out throughout human evolution uses the traditional reductionism paradigm, which even if it is very successful, still has some limitations. Aristotle wrote in Metaphysics “The whole is more than the sum of its parts”. Inspired by this quote, in long term, Decebal would like to follow the alternative complex systems paradigm and study the synergy between artificial intelligence, neuroscience, and network science for the benefits of science and society. In 2017, Decebal received his PhD in Artificial Intelligence and Network Science from TU/e. During his doctoral studies, Decebal undertook three research visits: the University of Pennsylvania (2014), Julius Maximilian University of Wurzburg (2015), and University of Texas, Austin (2016). Prior to this, in 2013, he obtained his MSc in Artificial Intelligence from Maastricht University . During his master studies, Decebal also worked as a part time software developer at We Focus BV in Maastricht. In the last year of his master studies, he also worked as an intern at Philips Research in Eindhoven, where he prepared his internship and master thesis projects. Decebal obtained his Licensed Engineer degree from University Politehnica of Bucharest. While in Bucharest, between 2001 and 2010, Decebal started MDC Artdesign SRL (a software house specialized in web development), worked as a computer laboratory assistant at the University Nicolae Titulescu, and as a software engineer at Namedrive LLC.